Winter Roofing—Which Roofing Material is Best for Ontario Winters? A simple Google Earth view will tell you that winter roofing here in Canada is different. We don’t just choose our roofing for the aesthetics, we also choose it for how it holds up in winter—and how well it insulates your home against winter weather. So…just which roofs are ideal as a winter roofing material? A metal roof is the creme-de-la-creme of roofing. Ice and snow literally slides right off it. With proper insulation they also keep your house significantly warmer. The only downside to them are the initial upfront costs, although some of that cost can be deferred by the value they add to your home and by the money you save in overall heating costs. Asphalt roofs are the standard Canadian roofing material as they are the most affordable material, and do reasonably well in Canadian winters. They aren’t as durable as some of the other materials though (like metal), specifically when it comes to ice. Ice dams are common with asphalt roofing materials, so proper precautions are necessary in order to prevent them. Before installing asphalt roofing on your home, talk to us about how to plan for ice-dam avoidance. Wood roofing is gaining in popularity due to the sheer beauty of it. The outdoor-look it gives to homes makes it a hit with homeowners. 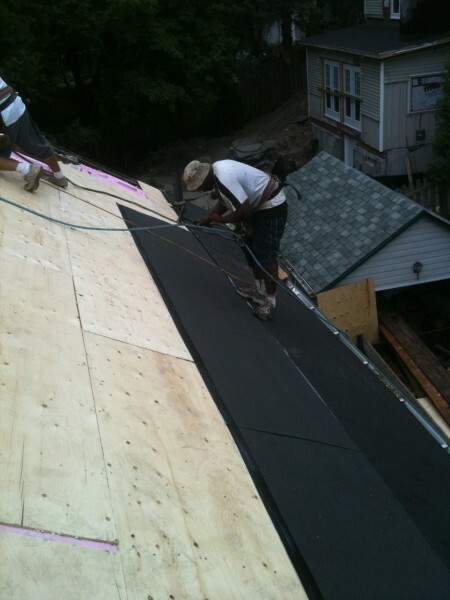 It is however one of the hardest roofing materials to maintain during the winter. You need to apply and reapply sealant to ensure that moisture from snow doesn’t seep into it—and heavy loads of snow need to be removed. Also, it needs to be inspected after major snow falls. Pitched roofing isn’t a roofing material but a roof type. A roof with a higher pitch/grade will offer a greater slope. This means snow and ice will slide off of it, instead of remaining on the surface where it can damage your roof. So, don’t think of material alone, but also the pitch. Ventilation is key to maintaining your roof during winter. Without ventilating heat and moisture from your attic or upper level both your attic and your roofing shingles will rot. Improper ventilation will also cause snow and ice to melt, which can form the dreaded ice dam. For help deciding which winter roofing material is right for your home, your budget and your maintenance schedule—call the winter roofing experts in Aurora and Richmond Hill, Dillon Bros Roofing. This entry was posted in Roofing Advice and tagged Ontario Winter, Roofing Advice, Roofing Materials, Winter Roofing, Winter Roofing Ontario. Bookmark the permalink.